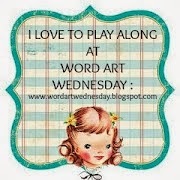 Happy Wednesday, everyone! Even though I'm not heading back to school this year, school is still very much on my mind. All of the retired elementary teachers from my school district get together for breakfast on the first day of school, and this year I got to join them...fun without the pressure! 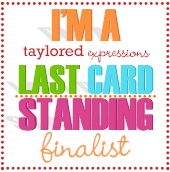 That being said...it's my turn to share a project over at the Sweet 'n Sassy Stamps Blog and so naturally I have a school project for you. September is the time for back to school cards and projects and Sweet 'n Sassy Stamps has some fabulous stamp sets and digi images just perfect for those projects. 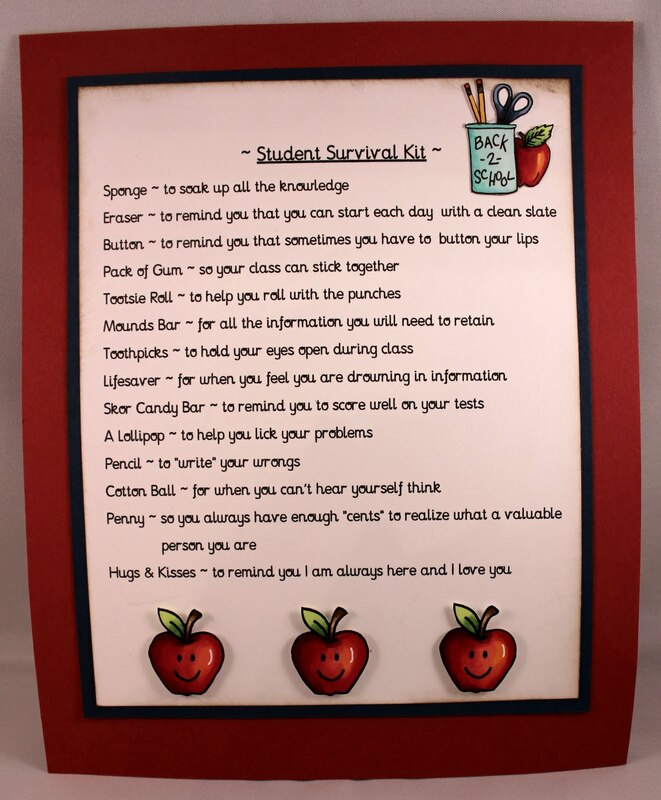 Now that many students are back into the school routine, they may be needing a little student survival. 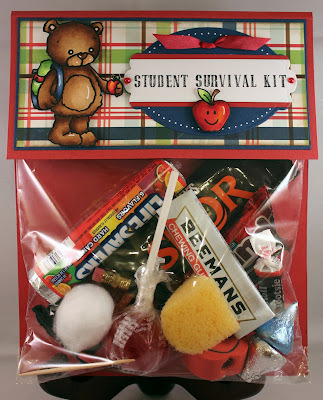 Creative Nugget: Here is everybody's favorite teddy, Rhubarb, with a student survival kit packed with items every student needs to make it through another year! The "Back to School Rhubarb" digi was colored with copic markers, cut out, and popped onto the cello bag topper layered with Echo Park DP. The tag was made by cutting a Spellbinders label die in red, white, and blue and then pieced together. The lettering on the tag was made with a JustRite stamper and the cute little apple is a digi image called "Apple of My Eye." On the back of the topper is an explanation of why each item is in the survival kit. (Click on the picture for a better view.) The little "Back 2 School Pencil Holder" digi is also available at the Sweet 'n Sassy Stamps Store. Survival kits are a cute gift idea that can be taylor made to let a special person know that you are thinking about them. Check out Sawyers Specialties for other suggestions for survival kits or come up with your own ideas. Then have fun putting your own kit together! Thanks for stopping by...have a wonderful Wednesday! It's Saturday and that means it's time for another Sweet Stop sketch. 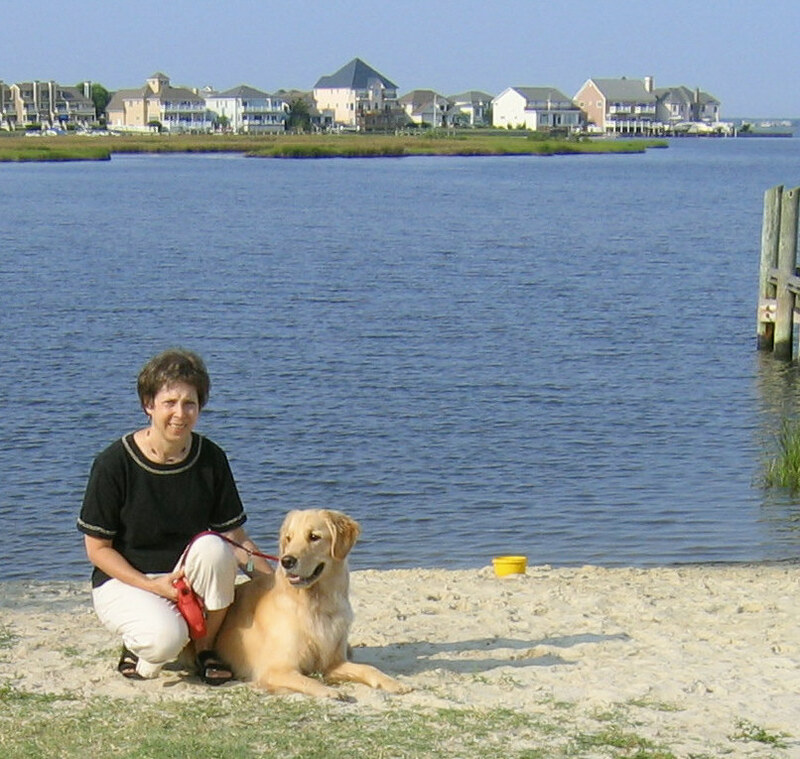 Before we get started, I want to extend my thoughts and prayers to all those along the east coast who are experiencing Hurricane Irene. I hope and pray that you all remain safe and that the damage caused by this storm is minimal. All across America, kids are heading back to school. Some have already begun...others around here will be starting on Monday...and some will begin after Labor Day. Young children have their backpacks filled with pencils, crayons, and glue sticks and are anxious to meet their new teachers and classmates. Some parents, with mixed emotions, will be sending their kindergartner off for the first time. Hopefully... parents and students alike are looking forward to all the new things that will be learned this year. Kids are naturally inquisitive, searching to gain meaning from their world, and this quest for knowledge is a good thing. However, applying knowledge and using what we learn requires wisdom. Spiritual Nugget: Have you ever known someone REALLY intelligent who lacked common sense? Or someone with lots of knowledge, but made really poor choices in life? What is the missing ingredient? Wisdom! The wisest man who ever lived was Solomon and he had pretty much to say about wisdom. "Happy is the man who finds wisdom, and the man who gains understanding;" (Proverbs 3:13) According to Solomon gaining wisdom is more important than silver, gold, and rubies and must be diligently sought after. Solomon also tells us that it is the Lord who gives us wisdom. "The fear (reverence, respect) of the Lord is the beginning of knowledge, but fools despise wisdom and instruction." (Proverbs 1:7) Wisdom can only come from getting to know the Lord better. There are 31 Proverbs...that is one for every day of the month. 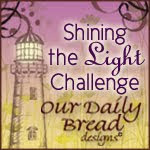 I like this statement by Max Lucado, "Reading Proverbs turns on the lamps in the dark corners of life." So send your children off to school to gain knowledge, then sit with them each day and read a Proverb to turn that knowledge into wisdom! 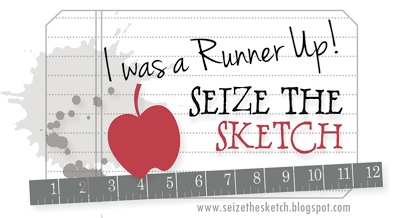 Creative Nugget: I used the theme of heading back to school for my Sweet Stop sketch sample this week. I just love this adorable Mo Manning digi image of a little girl heading happily off to school. She is colored with copic markers. Stickles were added to the collar and hem of her shirt for some sparkle. A jelly roll pen was used on the trim of the backpack for more sparkle. Glossy Accents were used on her hair bows, the little heart on her backpack, and on the heart punched buttons in the corner of the card. The card base was embossed and the raised areas sponged with tea dye distress ink. The pencils on the Cosmo Cricket DP fit the theme of the card perfectly. The polka dots on the red panel were stamped with VersaMark and clear embossed. The sentiment is from an OLD retired Stampin' Up! set. 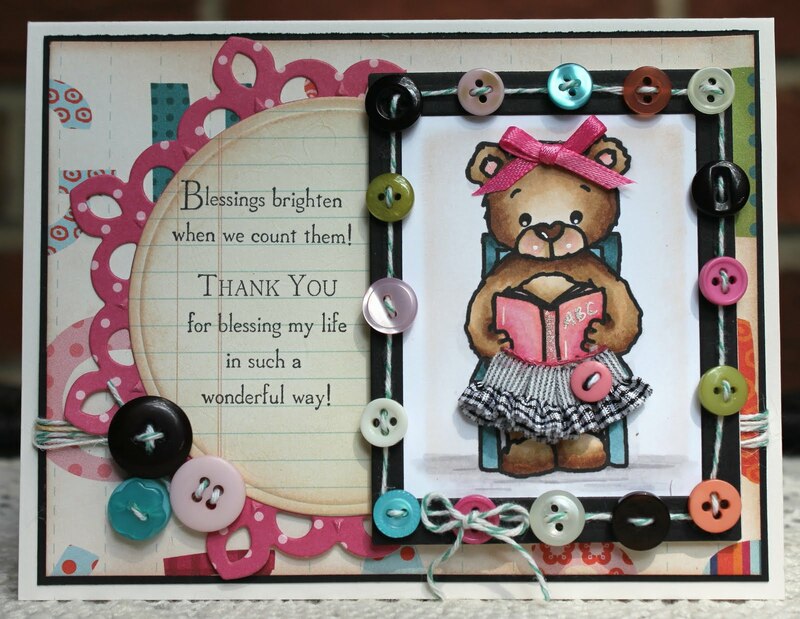 A button and gingham ribbon complete the card. I had so much fun making this card...hope you like it! Check out what the other Sugar Babies have done with the sketch! 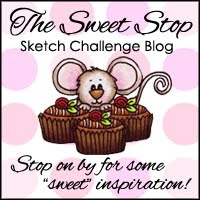 Come join us in the sketch challenge this week and use the linky tool at The Sweet Stop to upload your card. We'd love to see how you use the sketch! Thanks for visiting with me today...have a safe weekend! This past Sunday Korin Sutherland, illustrator and owner of Sweet 'n Sassy Stamps, was the featured stamper over at SCS. Not only is Korin a sweetheart, but she is a very talented stamper and has a fabulous gallery. It was so much fun to CASE several of her cards. The featured stamper challenge is one of the best challenges to participate in because you have an opportunity to learn new techniques and improve your craft by imitating some of the best talent around! Inspirational Nugget: We all have role models...right? You know...someone you want to be like when you grow up. The important thing is to find someone worthy of modeling your life after. Some people find famous sports figures, movie stars, business tycoons, or religious leaders to emulate only to be disappointed as these people fail, compromise their principles, or reveal character flaws. The problem is, as humans we will all eventually fall short of someone's expectations. So where in the world can we find a good mentor? Paul writes in 1 Corinthians 11:1, "Imitate me, just as I also imitate Christ." Did you catch the solution to the problem? Paul strove to imitate Christ and so can we. The perfect role model, the one with no spot or blemish, the one who will never fall short of our expectations...Jesus! I challenge you to read His word...get to know Jesus...and let Him be featured in your life...strive to be like Him! Let's CASE Jesus! Creative Nugget: I decided to CASE Korin's Season of Change card. I kept the same basic layout, theme, and colors. I liked the idea of stamping the sentiment behind the four leaf panels, but didn't have the same stamp set, so I changed the sentiment. 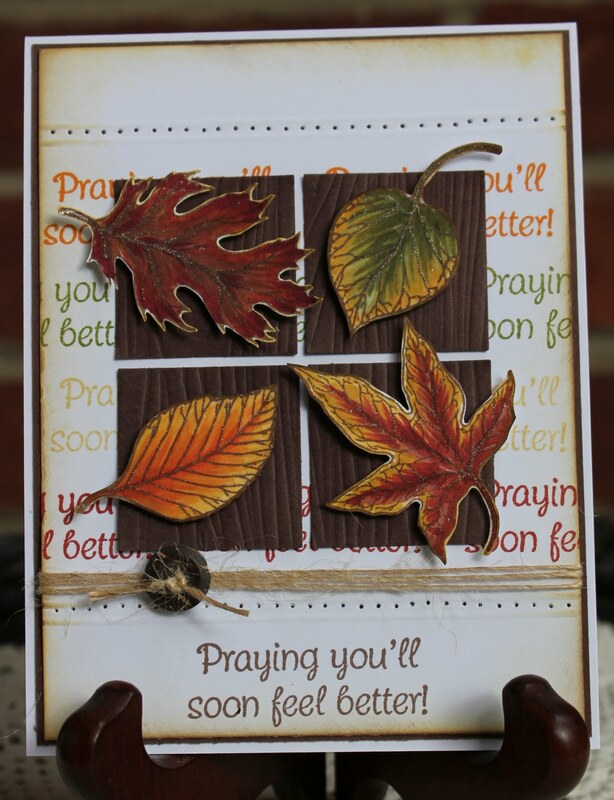 The leaves from the Autumn Leaves set, just released from Sweet 'n Sassy Stamps, were colored with copic markers, cut out, and popped up on punched squares of Chocolate Chip card stock impressed with a wood grain pattern. 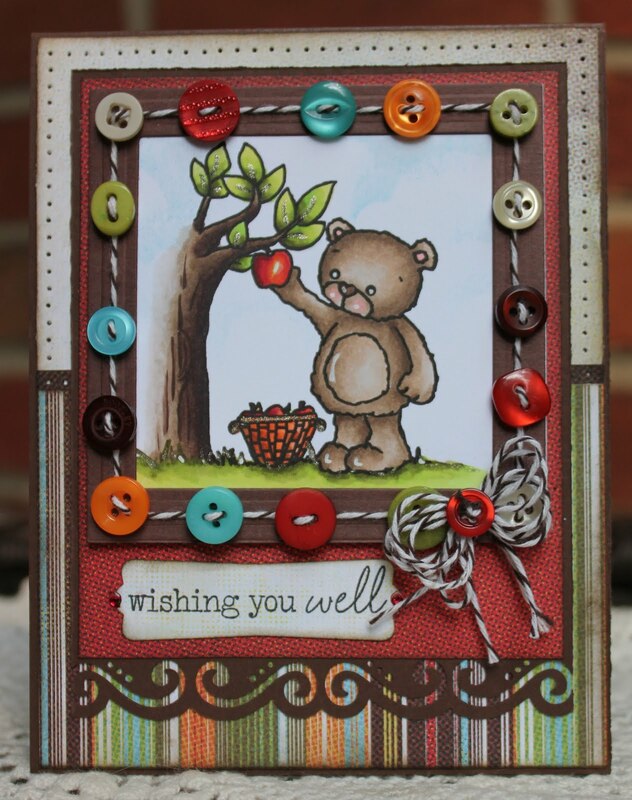 Piercing, button twine and a rustic button were added to complete the card. This card was inspired by another of Korin's Season of Change cards. I kept the same layout, but added an extra layer. A gold leaf pen was used to make a border around two of the panels. The leaves from the Autumn Leaves set were stamped randomly on a Vintage Cream panel with VersaMark Ink and embossed with detail white embossing powder. Distress Inks were then sponged on each leaf, beginning in the middle of the leaf and working outward. This created a kind of a halo around each leaf. 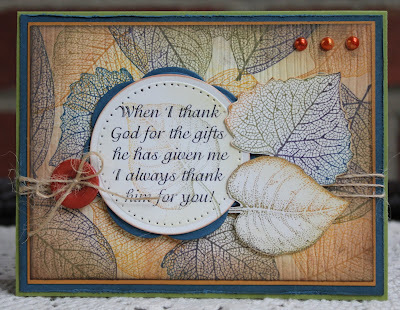 The sentiment was stamped under the leaf panel and pearls were added to the upper left of the card. These are my cards for today! Thanks for the inspiration Korin! I like how both cards turned out and I hope you do, too! Thanks for stopping by...Have a wonderful day! Buttons and Fibers and Bears...Oh My! Happy Saturday to you all! I'm so glad you stopped in for a visit because it's time for another Sweet Stop sketch! This week's sketch has a spin and that is to use fabulous fibers. I love button twine and Baker's twine, but wasn't sure how I was going to use it in a unique way until I saw Stef's inspiration challenge from last Saturday at SCS. Blumenthal Lansing is the place to shop for buttons and this FRIENDS picture frame provided the needed inspiration. 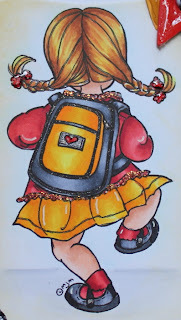 Creative Nugget: Since it's time for many students and teachers to head back to school, I chose Reading Rhubarb, a Sweet 'n Sassy digi image, as the subject for my card, but turned Rhubarb into Rhubarbette by adding a skirt and a bow. The skirt was made with a piece of ruffled ribbon with the top ruffle cut off and adhered to a piece of button twine for the little waist band. The image was colored with copic markers. The frame was made with rectangle nesties and buttons strung with Baker's twine. Easy-peasy...but oh so cute! 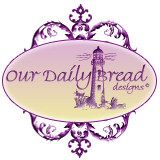 The circle part of the sketch was layered onto a fleur de lis motif die from Spellbinders. The frame and the circle were then layered onto a piece of Cosmo Cricket DP. I had so much fun making the button frame that I decided to do another one. 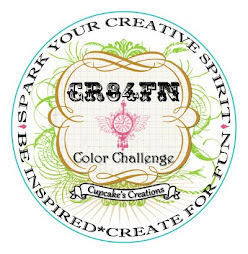 Now it's your turn to grab some fibers and this week's sketch and join the fun! There's even a chance to win the "Seeing Spots" clear stamp set from the Sweet 'n Sassy Store! While you're at it, don't forget to stop over at The Sweet Stop and see what the other Sugar Babies have done. You will be amazed at all the creative ways to use fibers on your cards! Thanks for spending some time with me today...just as the sentiment on my sketch card says...you my friends are such a blessing to me! Thank you for your many kind comments. Have a wonderful weekend! I am reminded of that song that says...Count your many blessings...Name them one by one! When we stop to consider all of our blessings...family, friends, God's provision, and even the refreshing weather we've had this week, we can feel truly grateful. As wonderful as these things are...and they are wonderful, I feel most blessed to be able to get into the presence of God! Inspirational Nugget: There was such a sweet presence of the Spirit of the Lord in our church service last night. Our pastor preached from Genesis 32 where Jacob, the deceiver, the trickster, the heel-grabber, found himself alone and had an all night wrestling match with the angel of the Lord. As morning approached he was touched in the hollow of his thigh and he became lame. Jacob came to the end of himself...to the end of his strength. All his planning and conniving and manipulating came to naught. All he was able to do was to hold onto the angel of the Lord, and he would not let go until he was blessed. As he submitted to the Lord, his life was changed; his name was changed from Jacob, the trickster...to Israel, blessed of the Lord, accepted by God! Sometimes in this life, all you can do is hold onto the Lord. Get a hold of Him and don't let go until you receive the blessing...not things...but the peace of God! If you're feeling that all of your plans are not working out, things are looking grim, hold onto God, submit to His will, and don't let go until you receive the blessing...the favor of God...His acceptance. Your circumstances may not change, but you will have peace. Now that's a blessing you can count on! 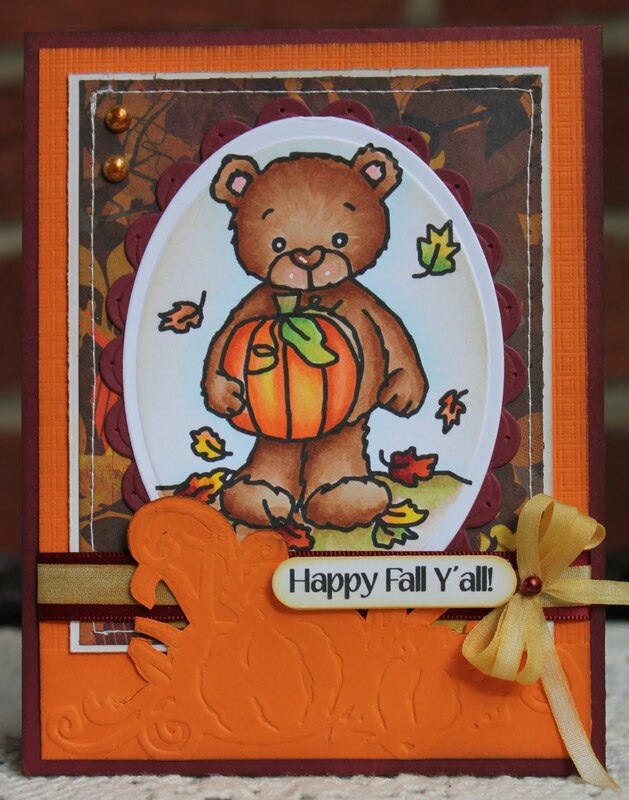 Creative Nugget: Yesterday Penny Allen (Pawallen142) was the featured stamper over at Splitcoaststampers. Check out her wonderful gallery. I chose to CASE her Flower Fest card. I kept the same layout, random stamping, and a popped up image. I changed the colors, changed the flowers to leaves, and added a button, twine, and a sentiment. 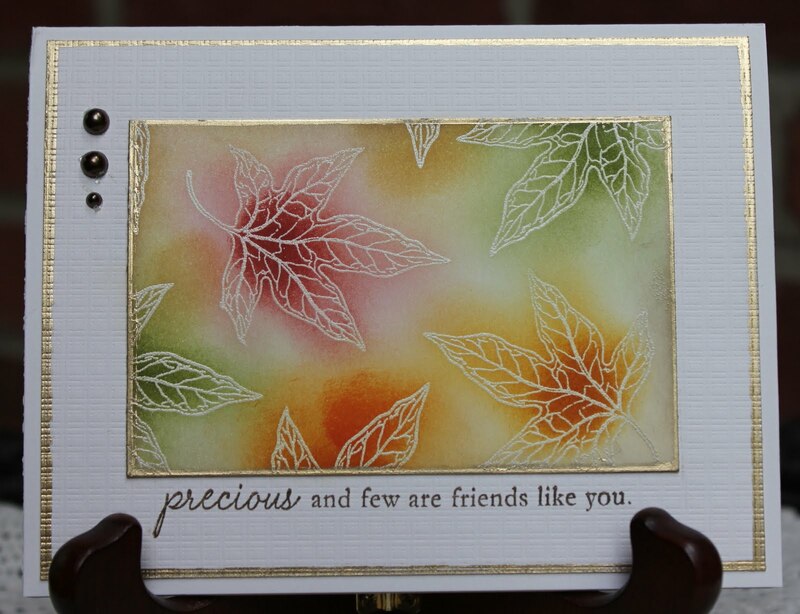 I haven't used a Kaleidacolor pad in ages and decided to stamp the leaves with the Late November pad. After stamping the leaves, a wood grain impression plate was used to give texture to the panel. The sentiment, pierced and mounted on a blossom die cut, is from the brand new Sweet 'n Sassy Stamps sentiment set, Many Thanks, being released tonight! 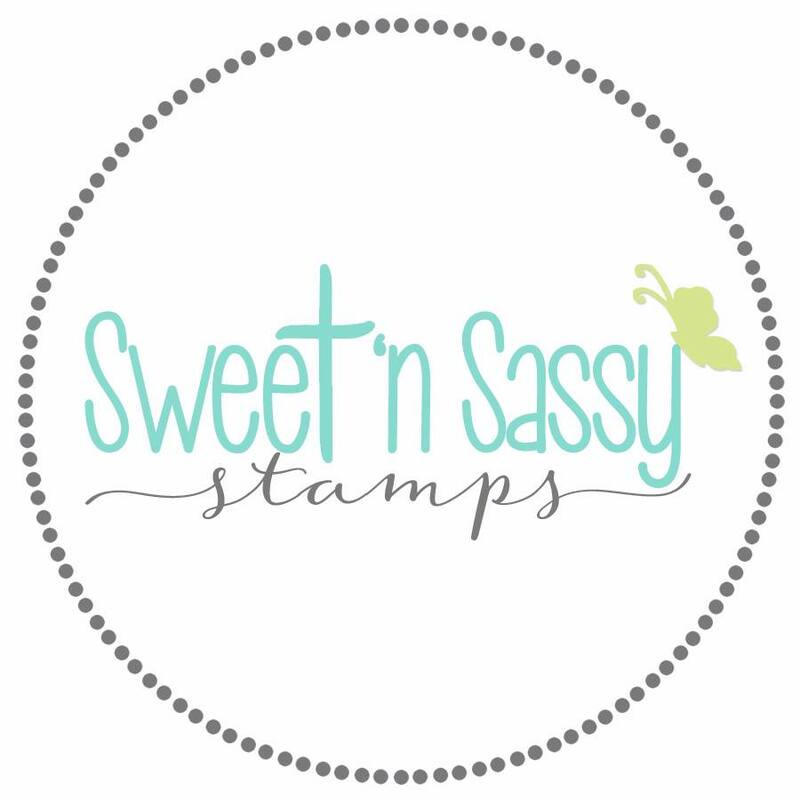 Sweet 'n Sassy Stamps is now a member company over at SCS! Yea! 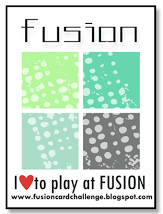 So come join us for the August release party tonight at 8:00 PM over at the Sweet 'n Sassy forum on SCS! Hope to see you there! Thanks for stopping by and have a truly blessed day! Yea! The weekend has rolled around again and I have two posts for you today so if you've decided to tune in, be sure to scroll down for The Sweet Stop sketch sample! Today is day six of the Sweet Peeks over at Sweet 'n Sassy Stamps! If you love Rhubarb, you will LOVE this new set being released next week on August 15th. Rhubarb's Autumn Joys contains not one, not two, but three adorable fall Rhubarb images and six wonderful sentiments perfect for every autumn occasion. Creative Nugget: Fall is my absolute favorite season of the year because of all the beautiful, warm colors. The Rhubarb image on my card was colored with these warm colors using copic markers. 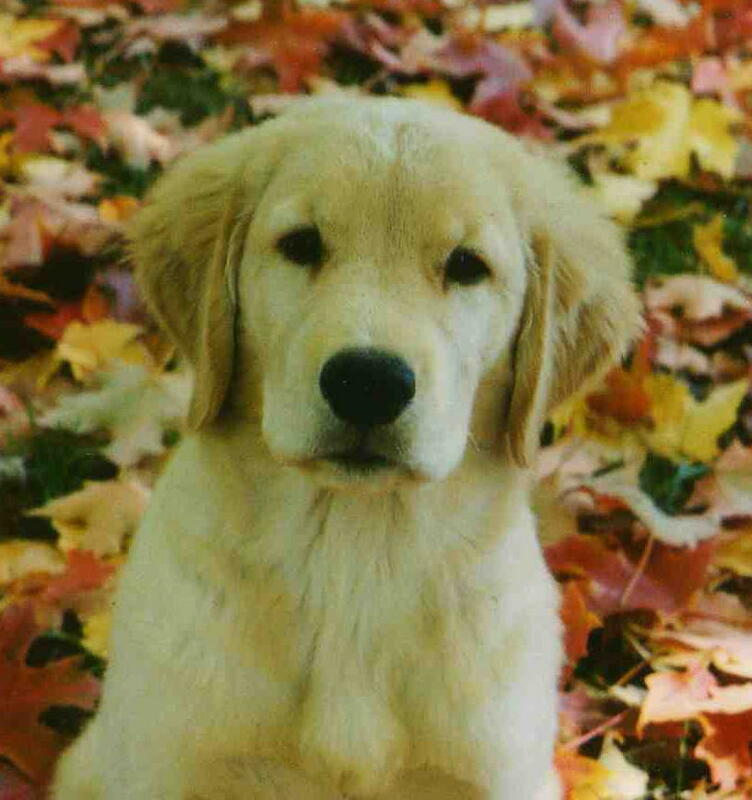 Don't you just love the leaves falling all around him in all of their fall splendor? This panel was put on a scalloped oval, and then on a wonderful piece of Basic Grey's Indian Summer DP that was stitched to a piece of Select White card stock. More pumpkins were embossed with a Sizzix embossing folder at the bottom of an orange zest panel. The top of the embossed pumpkins was cut with a craft knife so the Rhubarb panel could be tucked behind. Two ribbons were layered and tucked behind the pumpkins as well. The 1/4 inch white silk ribbon was stained with a scattered straw distress ink pad. The bow was made with the Bow-Easy. The cute sentiment was punched out with a word window punch and popped up on the ribbon. If you like this sample be sure to stop over at the Sweet 'n Sassy Stamps Blog to see what the other talented design team members have created with Rhubarb's Autumn Joys, and then join us at The Sweet 'n Sassy Connection for all of the fun activities, full reveals,....and some exciting news on the 15th of August! Welcome back to Golden Inkspirations! 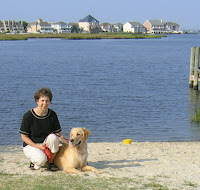 I must admit that my husband and I were devastated this past week when Casey, our beautiful golden, the inspiration for this blog and whose picture is on my blog banner, passed away suddenly due to complications from cancer. This blog post is dedicated to Casey. He will be missed so much and his passing has already left a void in our lives. Just look at this little fur ball! 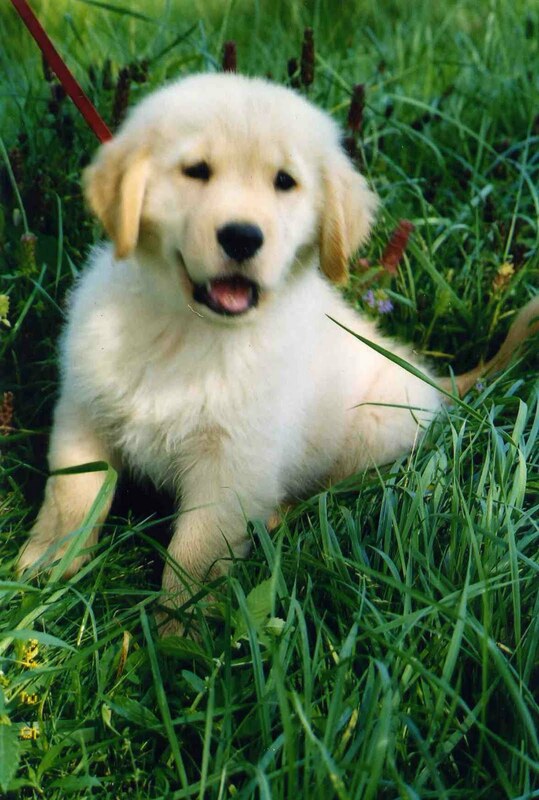 He was the most adorable puppy ever! 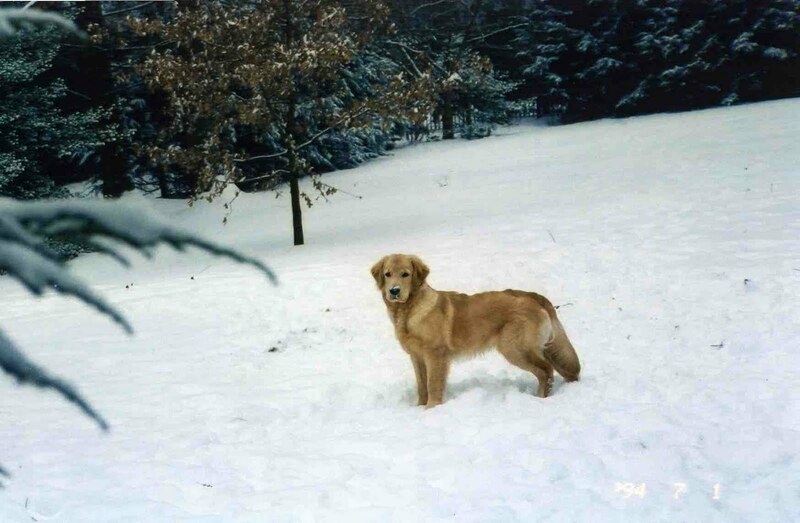 Casey loved frolicking in the snow! We will miss you, CASEY! My Sweet Stop sample for this week is a tribute to Casey! This is what I did this week with the sketch above. Creative Nugget: I just love this adorable digi image from Whimsy Stamps and thought it would make a cute tribute to our Casey. The image was colored with copic markers and cut with a square Nestability. The red DP layer was embossed with the brick wall embossing folder by Sizzix. This was then layered on some Max and Whiskers DP. This Basic Grey DP is just perfect for pet cards. A JustRite stamper with the Brayton Font was used for the lettering on the doghouse and on the sentiment. 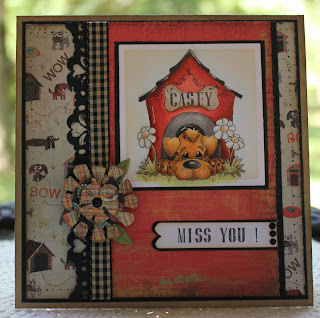 A punched border, gingham ribbon, and a paper flower finish the card...I hope you like it! Check in at The Sweet Stop and see what the other Sugar Babies have done with the sketch...you won't be disappointed! Happy Saturday to you! Are you ready for another wonderful Sweet Stop sketch? I just love all the new Rhubarb images available at Sweet 'n Sassy Stamps...don't you? There are over 25 adorable images of Rhubarb the Bear perfect for any occasion throughout the year. BUT...today I am returning to my first love. The very first Sweet 'n Sassy stamp I purchased was Cocoa. 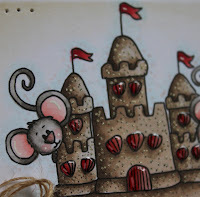 Cocoa the Mouse got my attention and helped me fall in love with Sweet 'n Sassy Stamps. Since I needed some beach thank you cards, I grabbed this Cookie and Cocoa sandcastle digi and started playing. 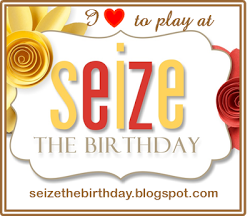 I have two cards for you today so scroll down to see the second one as well! Inspirational Nugget: Don't you just love spending time with the Lord...reading His word and praying? During the school year, I would feel so guilty because time would get away from me, and I would not spend that quality time with the Lord I love. When you don't spend time with your loved ones, the lines of communication break down...you feel frustrated, easily upset, lose perspective. The same things happen when we don't spend time with the Lord. He loves to hear from us! He loves when we spend time with Him! "To the angel of the church in Ephesus write: ... 'I know your deeds and your toil and perseverance, and that you cannot endure evil men, and you put to test those who call themselves apostles, and are not, and you found them to be false; and you have endured for My name's sake, and you have not grown weary. But I have this against you, that you have left your first love." (Revelation 2:1, 3-4) Don't forget to spend time with the Lord today. He's never too busy to spend time with us and He's got the whole world in His hands! Fall in love with Him all over again! 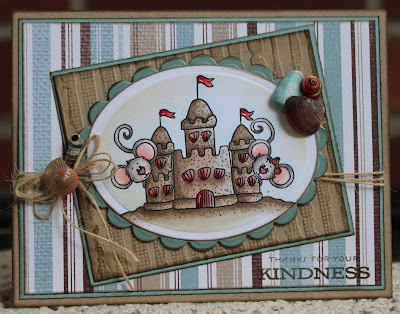 Creative Nugget: For this card I chose background papers that reminded me of beach colors. The main image with Cocoa and Cookie was colored with copic markers. The seashells on the sandcastle were given a coat of Glossy Accents. A new technique for me was used on the panel behind Cocoa. It's called "Double Your Pleasure" and JanTink over at Splitcoast challenged fan club members with this technique. You need one embossing folder and one background stamp. Run your card stock through the Big Shot. Lay your embossed panel upside down on top of the inked up background stamp and gently rub your finger on the debossed lines. The result is that only the embossed areas will end up with the background image. If you click on the card above, it will be enlarged and you can see the results better. Pretty cool...I'll be trying this again! Twine and a few shell embellishments were added to finish the card. 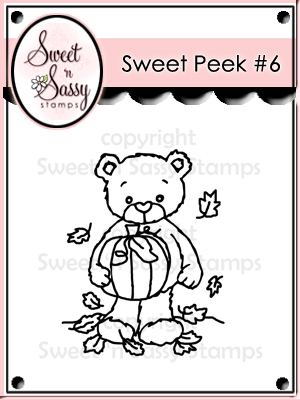 Stop on over to The Sweet Stop and see what the other Sugar Babies have done with the sketch...then join us and play along! Creative Nugget 2: As long as I was coloring this image, I decided to make another card using a layout by AmberDawn over at Splitcoast. For this card I used design papers from the Springtime paper pad by Echo Park...the background paper reminded me of waves, and the circular panel was embossed with the CB swirls folder which also looks like waves. The images are colored with my favorite...Copic Markers. Glossy Accents was added to the shells from the Flourish Seashells set for a bit of shine. A Sakura jelly roll pen was used to add a bit of sparkle to the sand. Here's a close-up of the sandcastle so you can see the sparkle better. I'll leave you with images of the beach so you can dream of being there! Thanks for stopping by today! Come back again for more inkspiration! Have a wonderful day weekend!